Saturday on the mountain top it was nearly 70 degrees. In late November. Sunday morning we woke up to this. It snowed lightly pretty much all day Sunday, with incredibly blustery winds. All in all, I think we got about a foot of snow. It was a great day to be indoors by the fire, for sure. 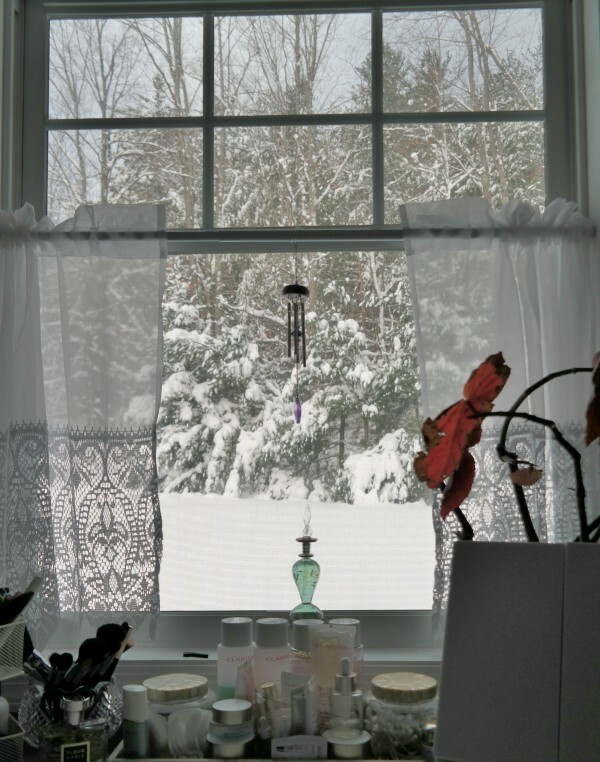 Fortunately, I had done what absolutely had to be done outdoors on Saturday, so I could look out at this incredible winter storm from the warmth of my cozy house. I puttered around doing inside chores and cleaning the house, happy to be warm and safe indoors. Looks like my poor horsey neigh-bor was trying to shield himself from the fierce winds by hanging out behind his little barn. I always feel sorry for the horses when we have storms. No doubt, they could go into their little barn for shelter at any time....they seem to enjoy roaming around in the snow and rain. If you look up at the top of the window you can see the massive icicles hanging off the roof. What? It's November....not even Thanksgiving yet! These are like January icicles! Sitting at the vanity in my master bathroom, my view is so serene. Truly a winter wonderland. It brings me great peace to gaze out at the back lawn and the woods beyond...it settles my mind in the mornings as I'm getting ready for work. 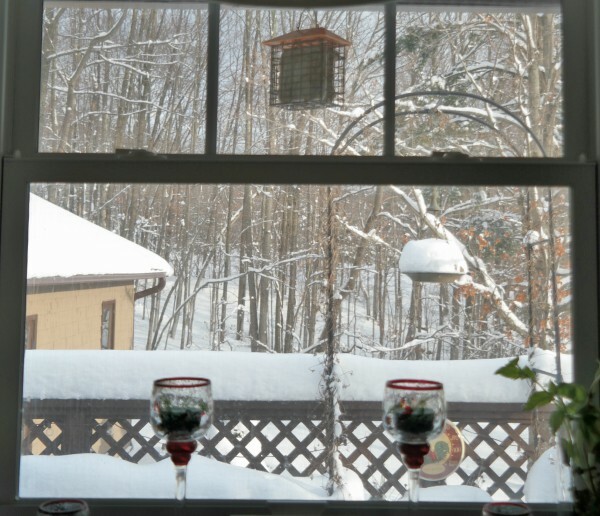 I filled all the feeders on Saturday to keep my poor birdies happy - but take a look at the hanging birdbath - not much sippin' going on there now! My daughter shoveled a path for me to the flat feeder so I could toss some seed and peanuts on there for the larger birds. I'm guessing the bears are hibernating by now as there's been no sign of them lately. Whew! I did, however, see a young buck (white tailed deer) as I was pulling into my driveway the other evening. I sure hope he has escaped all the gunshots I've been hearing lately in the woods all around the house. 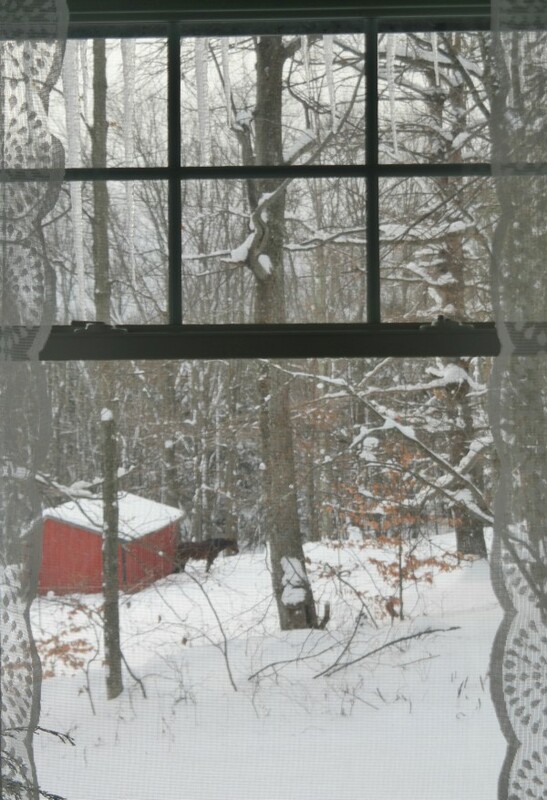 Meanwhile, the snow is swirling around outside my window again, and the wind is howling like mad. Oh my, I lived in snow for 18 years, so glad not any more. It is beautiful to look at, I just don't like having to shovel it and scrape the window on the car. Your pictures look so pretty. I'm not a huge fan of shoveling either, but I do love snow! It's finally gotten cooler here. I don't think we saw any snow at all last year. I think our weather skipped right over fall. Love your cozy digs! Is the A/C finally off for good, Brenda? All he local ski resorts are opening this Friday for the season - our foot of snow couldn't have come at a better time!! Oh...and you can click the link or do a search for master suite and see the bathroom, Melanie! The roads were pretty bad yesterday but much better this morning, Susie - have a fabulous Thanksgiving! Here in North Carolina we have been waking up to 30 or 40 degree weather in the morning and it gets up in the 70s by noon. That snow is crazy! But beautiful. Wow, that's quite the temperature difference in a day, Lisa! Cooler in western NC, but we still need rain. The highs have been in the 50s, lows in the 30s. We need moisture so desperately to fight the wildfires that I would happily take a foot of snow! I hear you - we had wildfires not too far from my house this summer/fall and all the local villages are under water restrictions. We need this moisture so badly I'll take it in any form!! That snow is just unbelievable! It is so pretty! It was 30 degrees here yesterday morning and windy...but that's nothing compared to what you have. Stay warm! Wow, sounds like winter has hit the teeny tiny farm as well as the mountain top! We have the exact same weather, Deb. It is a winter wonderland here, too with high winds tonight. I'm not ready for this. It is what it is, Deb - just another excuse for a cup of tea by the fire with your kitty cats, am I right? What a huge change in the weather! It does look beautiful though. :) We are awaiting some snow here later in the week and I am praying that we can still make it to our big extended family Thanksgiving. We have to take my car and return my son's truck to him that day also. I don't drive well on snow or ice so I am a little afraid. Oh boy, please be incredibly cautious driving, Debbie! I just got my studded tires put on right before the snow, and I'm still a nervous Nellie on the roads! OH MY GOODNESS that is a real snow for sure!! So much all at once!! Makes for pretty pictures! Definetly makes one want to snuggle in front of a big fireplace. That's my favorite thing to do in the winter months, for sure! 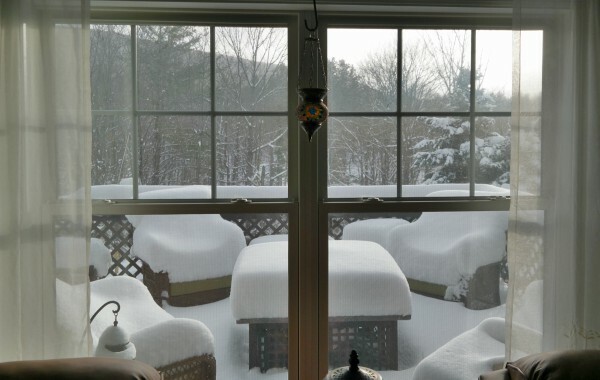 Wow, that was a lot of snow, perfect for cozying up in front of the fire. It sure was a lot of snow!! Way more than any of us expected!! Well, that is crazy weather for sure, 70 one day and a foot of snow the next! We have been staying in the 40s for the last two months, with mostly rain, and a few snowflurries, but nothing that has stayed. Our turn is coming quite soon, I'm sure! 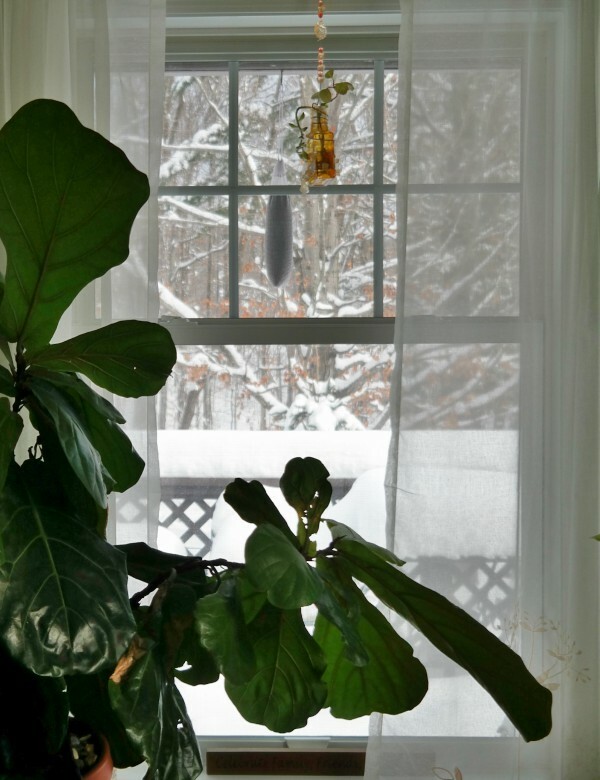 I love those puttering about the house days, so cozy and delightful to look outside at the snowfall as you are warm and cozy inside. Just pure delight! And I agree, I have never seen icicles like that in November, bizarre for sure! 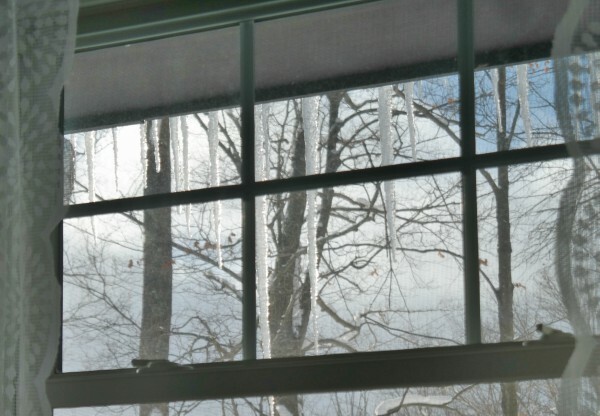 The icicles are absolutely HUGE today, they are so beautiful outside the window! Happy Thanksgiving to you as well!! WOW...absolutely gorgeous!! So glad you have some snow! I think there has been some really bizarre weather across the country so far. Hopefully that is all about to change! Happy Thanksgiving! Love and hugs! Happy Thanksgiving to you, sweet Benita! The farmers almanac predicts a very snowy winter, and so far they are spot on!! Southwestern Virginia.... in the mountains. We are having 30 degree nights and daytime temps (now that those awful winds have stopped) in the 50's. Not so bad, but I am missing the color of the autumn leaves on our trees. Colder temps and trees without leaves can be quite dreary. Snow, when it comes, will brighten things up. It sure does - I love looking out at it! Very pretty, but too much for me to handle. This morning is southeast FL it was 57 and real feel was 55. Right now it is 77 and feels like it is 79, under clear blue, sunny skies. And you have a wonderful Thanksgiving at Plum Cottage, Lorraine! How tranquil it looks. Like a blanket of comfort, as long as you're indoors, of course! We are enjoying a lovely stretch of true fall weather. Highs in the 70's, lows in the 50's and lots of sunshine. And the very same to you, Daisy - enjoy your Thanksgiving in the sunshine! Hi Deb we are having the most bizarre weather here in Illinois too. It was up in the 70's and then dropped to the 30's. Crazy. We have not seen the white stuff yet!!! Yours looks so pretty. No doubt the white stuff will hit you guys soon enough, Kris! Happy Thanksgiving to you as well!! Hard to know, Donna - the sad thing is that I never got my gardens properly cut back and put to bed. Oh well! The views out of our windows look a lot like yours (minus the mountains...and the horses). We had such a warm autumn and then suddenly we were hit with a snowstorm and we're in the middle of winter already. Unfortunately I had to drive home from work in the middle of a white out - I'd much rather have been at home baking cookies and listening to Christmas music. Enjoy your pretty vistas! Isn't it crazy, Vickie? Old Man Winter must have missed us terribly last year to make such a fuss this early on! Wondering how you manage driving the mountain with that snow? It was sunny and *73 here in Oklahoma today. We don't usually get much snow in the winter but we do tend to get icy spells occasionally. Have a wonderful Thanksgiving. I drive a Subaru with studded snow tires, that's how! My daughter also drives a Subaru...and my other daughter a Jeep. We all have 4 wheel drive, which is absolutely vital in a region like ours! It's been nice here but windy.A few days of rain. Do they not put a blanket in the horse? Around here everyone uses blankets. I have never seen them put blankets on the horses, but I sure wish they would! Looks pretty as a picture post card. It was, while it lasted, Barbara! OMG wow! So much snow!!! No kidding - crazy, right? Welcome to my little world, Cindy - I'm so glad you're here!! How charming, a 900 sq foot cabin - no doubt I would love it!! Where is your cabin located? Not in Florida, I'm sure! Merry Christmas to you and your hubby, Cindy!! Well, we live in PA east of Pittsburgh. All of our snow is gone thanks to a "thunderstorm" and tons of rain. If it freezes we will have a wonderful ice skating yard!! FL after the holiday. Where are you located? Hi Cindy - I am in the mountains of upstate NY. Same here, our snow is mostly gone - no doubt there will be more!! Merry Christmas to you, Cindy!